Is WinQuickLotto a Scam or Legit? Read Reviews! 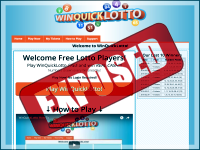 WinQuickLotto Exposed — Is Your Ticket Really Free? Everyone likes something free right. WinQuickLotto.com offers a free lottery game each and every Wednesday. It’s a straight forward 6 number lottery ticket game with a bonus ball. The jackpot isn’t going to be one of those mega wins, but then playing is free – or is it? This free lottery is drawn once a week on Wednesday night. Players have until Tuesday at 11:59 Pacific Standard Time to get their ticket lines. For each ticket line, you choose six regular numbers from 1 to 59, and one bonus ball from 1 to 30. There are six prize tiers starting at the top with USD 250,000 for six out of six numbers, plus the bonus ball, down to three out of six balls winning 3 tickets. Okay, it’s not a big jackpot but playing is free. Winquicklotto.com has advertisers who fund the prizes. While your ticket is processed, advertising comes up for you to view. You can save it for later or wait until the screen pops up with your ticket confirmation. They say you can do 14 ticket lines per week depending on your patience in viewing advertising. But, only one ticket can win. Yes, it is the highest value winning ticket. Players have one month to claim your winnings and it can take up to thirty days to get your money. The only way to get your winnings is through PayPal (so I guess they are one of the main advertisers). Who Can Play at Win Quick Lotto? If you want to jump into this free lottery game, make sure you are playing from Australia, Canada (but not Quebec), Ireland, New Zealand, South Africa, the UK and the US of A. If you’re sitting in any other country, you can’t play. Remember this is an advertisers’ funded game so they want to make sure you would be interested in their stuff. Oh – and you have to be 18 years of age or older. WinQuickLotto.com has an online form and an email address. There isn’t a snail mail address or telephone number, hence we’re not sure where these folks are actually based. Scamadvisor.com says that they are US based “but the real location is hidden”. There is no information about who owns and operates this site. There are a bunch of links to other contests that only seem to work if you’re in one of the countries that you’re allowed to play from. There are also links to other games on their website like SwipeHype and Bejeweled. Click on the advertisers menu and you find out how much they are paying for the advertising you are viewing. Would you mind rating WinQuickLotto.com ? This free lottery site is pretty upfront about the fact they operate for and by advertising. You don’t have to give them a credit card or anything. Then again, we’re back to the ole question just how much advertising am I going to get over and above looking at stuff to get my tickets. Plus, do I really want to spend my time looking at advertising just to get a free ticket. Sorry folks, this site gets a thumb’s down. Rather than looking at a bunch of advertising for tickets, I’d rather spend my time figuring out my lucky numbers for US Powerball or EuroMillions and go after those mega jackpots.